Alumnus, lawyer, politician, Prime Minister, Chancellor: John George Diefenbaker was many things. He was also a veteran of the Great War. 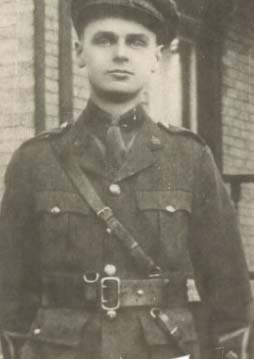 On 25 August 1916, less than a month before his 21st birthday, John Diefenbaker volunteered for service. He signed up in Regina and joined the 196th (Western Universities) Battalion, CEF. President Murray of the University of Saskatchewan was instrumental in creating the Battalion that consisted of a company from each of the four western provinces. The 196th trained at Camp Hughes in Manitoba and was then sent to England. Its history was brief. Once in England it was broken up to reinforce existing units. While stationed at the at the Military Training School Crowborough, UK, Lieutenant Diefenbaker was injured. As a result, he was removed from service as an invalided back to Canada in 1917. He resumed his studies at the University of Saskatchewan, graduating with a Law degree in 1918. There are only a few images in the Diefenbaker Collection related to his participation in the Great War. The bulk to the above link contains link above contains documents relating to John Diefenbaker's participation in the Saskatchewan Vimy Pilgrimage Club and his trip to the battlefields of France. Items include, memorabilia, correspondence and the Vimy Ridge Canadian Passport. All of the scanned images come from the University of Saskatchewan Diefenbaker Archival Collections, MG 411.